Milk - the best of all foods is also the least expensive. Does your little one look the picture of health? 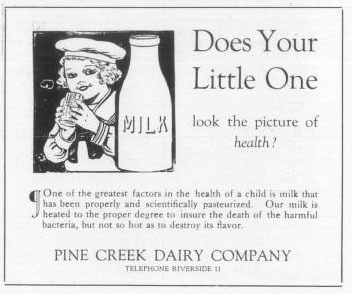 One of the greatest factors in the health of a child is milk that has been properly and scientifically pasteurized. Our milk is heated to the proper degree to insure the death of the harmful bacteria, but not so hot as to destroy its flavor. Telephone Riverside 11. Milk. A real food. 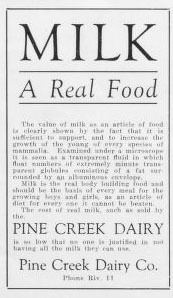 The calm of milk as an article of food is clearly shown by the fact that it is sufficient to support, and to increase the growth, of the young of every species of mammalia. Examined under a microscope it is seen as a transparent fluid in which float numbers of extremely minute transparent globules consisting of a fat surrounded by an albuminescense envelope. Milk is the read body building food and should be the basis of every meal for growing boys and girls, and as an article of diet for every one it cannot be beaten. 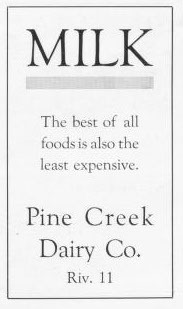 The cost of real milk, such as sold by the Pine Creek Dairy is so low that no one is justified in not having all the milk they can use. Phone Riv 11. 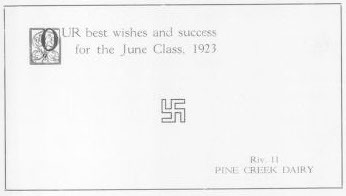 Our best wishes and success for the June Class: 1923. Riv 11. 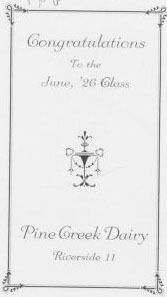 Best Wishes to June Class, 1925. 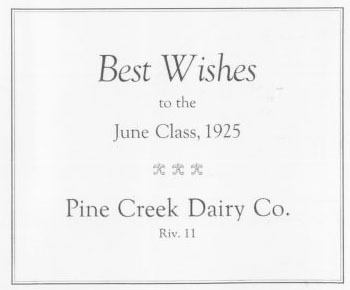 Pine Creek Dairy Co. Riv. 11. Congratulations to the June '26 Class. Riverside 11. Our personalities are broadcasting stations of our inner selves. Riv. 0011. Milk - has, from the beginning of man's life upon the Earth, been the most important item in the diet. 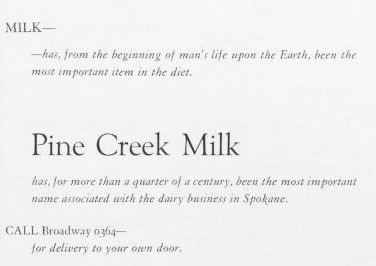 Pine Creek Milk has, for more than a quarter of a century, been the most important name associated with the dairy business in Spokane. Call Broadway 0364 - for delivery to your own door.